Some years ago a group of ladies who were active supporters of the arts in Malaysia invited me to give a talk introducing the new season of concerts at Dewan Filharmonik PETRONAS. They wanted me to point out the highlights, suggest concerts they should attend and, most importantly, make sure they all knew which concerts were so important that no self-respecting supporter of the arts would dare not attend. It was very difficult. That season a decision had been taken not to invite guest orchestras or big name soloists, and without the draw of famous names or the fascination of strange orchestras, it was difficult to engage their interest. I realised, not for the first or the last time, that for many people, classical music is very much personality driven. ﻿How I wish that talk could have been this year and to a group of Singaporeans, for there's a concert coming up which, while it features neither big name soloists nor unfamiliar choirs, orchestras or conductors, is nevertheless an absolute must for any supporter of the arts or, indeed, any music-lover. 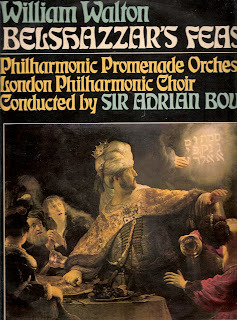 On Friday 15th April the Singapore Symphony Orchestra and Chorus are performing Walton's Belshazzar's Feast. I've sung in it, played in it and would have given my right arm to conduct it (although that would rather have defeated the purpose, I suppose) and it remains the one work which comes closest to being that elusive thing, "my favourite composition". Funnily enough, I don't have any really outstanding recordings of it, and I couldn't point you to one off the top of my head. But that's because it is one of the very, very few works I can summon up at a moment's notice on any occasion and in any situation from my memory, so firmly etched is it into my consciousness. My personal portable performance is probably an amalgam of some unforgettable performances I've heard in the past. I first heard it in Gloucester Cathedral during the Three Choirs Festival in, I think, 1970 conducted by Christopher Robinson and with the peerless Raimund Herincx as baritone soloist.. I sat mesmerised (there's no other word for it) by the sheer sound of it, those off-stage brass bands echoing through the dark aisles and around the transepts (the brass bands being a last minute addition when Thomas Beecham, who deciding the work would be a flop, had suggested to the composer shortly before its premiere at the Leeds Festival of 1931; "As you'll never hear the thing again, why not throw in a couple of brass bands?"). That performance was most memorable for the great choral shout of "Slain" which had such a physical impact that a bevy of bats was disturbed and flew madly about the cathedral's west end. It could have been disturbing, even amusing, but it was actually electrifying. Then there was the unforgettable André Previn performance at the Royal Festival Hall a few years later when a hugely popular baritone soloist got so overwrought at the climax of his great recitative that, after a spellbinding lead up - "Praise Ye. Pra-ay-ay-ay-ay-aise ye. The Go-od of…" - he allowed his Cornish roots to burst through in a great cry of "Gaw-awd". You could have heard a pin drop as the entire audience waited with bated breath to see whether the LSO chorus would copy his extraordinary enunciation in their great choral restatement; but in the event they were as good as Gold. I think it was at the Albert Hall – maybe even a Prom – when I first heard the glorious Willard White in the role, and the vision of his dark, austere, forbidding demeanour and his mighty, magisterial voice, sent great pulses of awe through my body, causing every hair to stand on end and the blood to run cold. With all these great performances so firmly embedded in the memory the Singapore performance on 15th April will have a lot to live up to. But the great thing is, no matter what they do, it will set all those memories running again in my head and I know I will come out of the performance as excited and enervated as I was 40 years ago. The American soloist, Stephen Powell, is a new name to me, but the Singaporean conductor, Lim Yau is not, and I have no doubt he's going to come up with a marvellous performance; he always does, whatever the work. How the choir, in particular, will respond is of more interest to me since, in the first half, they are performing a work about as different from Belshazzar's Feast as it's possible to get, the Stravinsky Symphony of Psalms. The two works might be as different as chalk and cheese – the Walton powerful, blazing in its imagery and painted in a myriad colours, the Stravinsky discreet, intimate and focussing on rhythm above expression – but they both have a dear place in my heart. I've not only sung in, played in AND conducted the Stravinsky, but the ethereal "Alleluya" remains one of my most Magical Musical Moments of all time. Some years ago I took part in a charity show in which eight critics were invited to list and explain the one musical moment – a single chord, a short phrase or the setting of a single word – they could not live without. I chose the Stravinsky and, I readily confess, I would again. Oh, this is an absolute MUST ATTEND! Would you like to review it for ST?